پگاه فر, نفیسه, علی اکبری بیدختی, عباسعلی, زواررضا, پیمان. (773). بررسی گرادیان سرعت باد و شدت تلاطم بی‌بُعد شده با استفاده از نظریه همانندی مونین-ابخوف در زیرلایه زبری در یک منطقه شهری با توپوگرافی پیچیده (تهران). مجله ژئوفیزیک ایران, 5(2), 69-85. نفیسه پگاه فر; عباسعلی علی اکبری بیدختی; پیمان زواررضا. "بررسی گرادیان سرعت باد و شدت تلاطم بی‌بُعد شده با استفاده از نظریه همانندی مونین-ابخوف در زیرلایه زبری در یک منطقه شهری با توپوگرافی پیچیده (تهران)". مجله ژئوفیزیک ایران, 5, 2, 773, 69-85. پگاه فر, نفیسه, علی اکبری بیدختی, عباسعلی, زواررضا, پیمان. (773). 'بررسی گرادیان سرعت باد و شدت تلاطم بی‌بُعد شده با استفاده از نظریه همانندی مونین-ابخوف در زیرلایه زبری در یک منطقه شهری با توپوگرافی پیچیده (تهران)', مجله ژئوفیزیک ایران, 5(2), pp. 69-85. پگاه فر, نفیسه, علی اکبری بیدختی, عباسعلی, زواررضا, پیمان. بررسی گرادیان سرعت باد و شدت تلاطم بی‌بُعد شده با استفاده از نظریه همانندی مونین-ابخوف در زیرلایه زبری در یک منطقه شهری با توپوگرافی پیچیده (تهران). 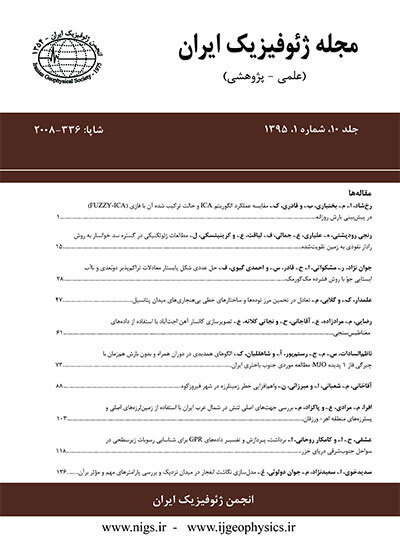 مجله ژئوفیزیک ایران, 773; 5(2): 69-85. نظریه مونین-ابخوف (1954) از ابتدا تا کنون اساس بسیاری از تحقیقات صورت گرفته در لایه مرزی جوٌ، به‌ویژه لایه سطحی، بوده است. از آنجا‌که این نظریه روشی کم‌‌هزینه برای برآورد شدت تلاطم و شارها که اساس کار مدل‌های پخش است به‌دست می‌‌دهد، مورد توجه خردهواشناسان نیز قرار گرفته است. درنتیجه، این نظریه در بسیاری از آزمایش‌‌های صورت گرفته بر سطوح متفاوت شامل آبها، مناطق روستایی، شهری و جنگلی، بررسی شده است تا صحت و دقت روابط همانندی که با آن پیشنهاد می‌‌شود، سنجیده شود. از‌این‌‌رو در این بررسی سعی شده تا خلاصه‌‌ای از تحقیقات صورت گرفته برای محاسبه پارامترهای لایه سطحی که در نظریه مونین-ابخوف از آنها استفاده می‌‌شود، به‌‌همراه مراحل پیشرفت، تعدیل و تکامل این نظریه از ابتدا تا امروز تهیه شود. در این راستا کاربرد این نظریه در منطقه شهری که دارای توپوگرافی است نیز تحقیق شده، و روابط همانندی با ثابت‌‌های تجربی برای پارامترهای بی‌بُعد گرادیان باد و شدت تلاطم بی‌بُعد شده برای هر سه مولفه باد در منطقه شهری تهران و در زیرلایه زبری، محاسبه شده است. برای این منظور از داده‌‌های سودار موسسه ژئوفیزیک و یک برج 100 متری در نزدیکی آن استفاده شده است. نتایج نشان می‌‌دهد که این نظریه با رهیافت مقیاس‌‌بندی محلی را می‌‌توان در منطقه شهری با توپوگرافی پیچیده نیز به‌کار بست. بزرگ بودن گرادیان بی‌بُعد باد و شدت تلاطم بی‌بُعد شده در منطقه نسبت به تحقیقات صورت گرفته در سایر مناطق، ضرورت استفاده از ضرایب به‌دست آمده برای بررسی مدل‌‌های پخش در منطقه تهران را نشان می‌‌دهد. Since, the Monin-Obukhov similarity theory (1954) (MOST) has been investigated in numerous studies, especially for the atmospheric surface layer. This theory provides a low-cost method to estimate non-dimensional turbulence intensity and dimensionless wind gradients that are the bases for the dispersion models. Therefore, this theory has been examined for many surface types, such as water, forest, rural, and urban areas to validate the predicted similarity relations. Since the similarity relations were often found for neutral stratification, some modifications need to be made in order to make them applicable for the other stability conditions and, hence, some stability correction functions are applied. The hypothesis of constant surface fluxes with height as a basic assumption of MOST, makes it unpractical for terrains such as forests and urban areas, over which surface fluxes vary horizontally and with regard to height. For these terrains, the local scaling approach was applied to solve this problem. Similarity functions derived using local scaling were examined in numerous experiments and showed good agreement with observational results. In this paper, the applicability of MOST was studied over an urban area with complex topography (Tehran) and with a rough sublayer as the lowest part of the surface layer. For this, we used data measured by a Sodar (model PA1) located at the Institute of Geophysics of the University of Tehran for the first 8 months of 2007. Sodar measured the speed and direction of wind, standard deviations of three components of the wind, and momentum fluxes. Also, data from a 100 m tower 150 m away from the Sodar position were used. This tower is equipped with four 2D sonic anemometers at 2, 10, 45 and 100 m, which measure the speed and direction of wind and the temperature. To validate Sodar data, the u and v components of the wind at 45 m from Sodar were compared with those from the tower at 45 m. The results illustrate good agreement and show similar trends. The first aim of this research was to determine whether the similarity function can be fitted to the non-dimensional wind gradient and standard deviations of three components of wind. Toward this end, non-dimensional wind gradients and dimensionless turbulent intensities were studied against the stability parameters which were calculated using the local similarity approach. Results show that MOST with the local scaling approach can be applied over this terrain. Therefore, similarity functions for these parameters were calculated. The second aim of this study was to compare calculated emperical constants for this terrain with that of previous results that were made over various surface types and for different stability conditions. To achieve an accurate comparison, neutral stratifications were also studied. The results indicate that emperical constants for the non-dimensional wind gradient and turbulent intensities over Tehran and in the rough sub-layer were larger than those of other surface types, including those over flat urban areas. This outcome reveals that the knowledge of the effect of Tehran topography, which may have a great influence on air pollution for this city, may be important. Different universal similarity functions and large emperical constants imply that applying results from other terrains to predict wind and air pollution over a city as large and heterogeneous as Tehran may lead to significant errors. The estimated constants for the empirical universal similarity functions found in this work appear to be necessary for applications in dispersion studies for Tehran.